Various racial concepts have been employed at different times in human history – most prominently since the 17th century – to classify humans into groups, often to great social, political, ethical, medical, and scientific significance. But what are races, and on what are they grounded? 1854 map by Charles Pickering, which shows 11 different races. One historically influential notion of race, that we might call traditional racial naturalism, held that race reflects a biological foundation, that separates humanity into discrete groups, that is transferred over generations, and explains the appearance and behavior of group members. Over the 20th century, however, this idea of race came under sustained criticism by anthropologists and evolutionary biologists. Indeed, following the work of the anthropologist Ashley Montagu, the UN issued a statement in 1950 declaring that there was no reason to believe in races. Similarly, an influential 1972 paper by the biologist Richard Lewontin argued that the role of genes in explaining human diversity is extremely small, further undermining the claim that races are biological categories. The accumulated evidence against traditional racial naturalism has led some philosophers to conclude that races are not real. These skeptics, or racial anti-realists, typically begin from the premise that a good theory of race must reflect folk notions of race – that is, ‘race’ as understood by most people – and assert that traditional racial naturalism does this best. Then, since traditional racial naturalism is false, it follows that races do not exist. Some anti-realists argue that using racial concepts is always irrational; others accept races as historical, non-biological categories. In any case, the position is that race is ultimately based on an illusion. An alternative strategy is to accept that there is no biological basis for race, but to hold nonetheless that race does exist as a social construction: this is the racial constructivist position. Constructivists deny that for races to exist, they must be biologically grounded. Some things, such as money or marriage, do not depend on a particular physical basis to exist (money can be represented by coins, notes, or virtual figures, and is not identical to any of these); yet, these things clearly exist, and in ways that affect the social world and actual people. Races, the constructivist argues, exist in much the same way: as social objects, grounded not in biology but in social concepts and interactions. There are different constructivist theories about what kind of existence races have. Thin constructivists understand races as generalized categories based on ancestry and superficial traits like skin tone and hair texture. For others, what is central is that the act of classifying has an effect on the classified (people) – causing them to have shared experiences – making race an interactive kind. Others observe that a person’s racial identity depends on the society they are in, such that a person may not have a sustained racial identity across different communities (or even within one): these observations suggest that the nature of race is institutional. Constructivists also debate whether race is primarily a political or a cultural construction. A third approach, sometimes called racial population naturalism, argues that races really are biologically grounded populations. These positions seek to reaffirm the biology of race – although in ways that differ, sometimes radically, from traditional racial naturalism. One defense of racial naturalism, called cladism, uses methods from systematic biology to separate groups based on their degree of genetic isolation over time, such that a race consists of individuals with a certain genetic ‘closeness’ to an immediate ancestor. The groups thus formed are non-static and, as it turns out, quite different from traditional racial categories. More recently, new work in population genetics has revived the argument that folk, or common, notions of race might have a biological foundation after all. Researchers have noted that it is possible to track an individual’s ancestry using genetic data alone, and that when such data is used to create an appropriate number of (usually five or six) clusters (using different methods of grouping than Lewontin ), the resultant groups look very much like folk races. While there is an ongoing debate about how best to interpret these findings, some philosophers have taken the results to show that biological races, in some sense, do indeed exist. But how do we decide on a definition of race? Race theorists have usually tried to produce a definition that represents folk intuitions, or gives an analysis of them. But some philosophers argue that we need to justify why one definition is better than another by weighing the variety of theoretical and practical, including political, social and ethical, costs and benefits of different racial identifications. The nature of the question is then perhaps not metaphysical but normative: we are really asking what we want our racial concepts to do, and so what ought to count as races. Some other philosophers, while agreeing that different theories of race rely on different linguistic contexts and frameworks, have suggested that coming to a single definition of race is both unlikely and unhelpful. Thus, they argue, we should be pluralists and take multiple accounts of race to be legitimate in different contexts. Apart from general philosophical and scientific curiosity, the deep and lasting influence of race on various aspects of people’s lives gives us reason to be interested in its nature. But this also opens race to a variety of claims and controversies that cannot easily be dismissed, from the ethical and social concerns of anti-racists to the scientific practices of medical researchers. How, or whether, a theory of race can account for all of these things remains an open – and difficult – question. 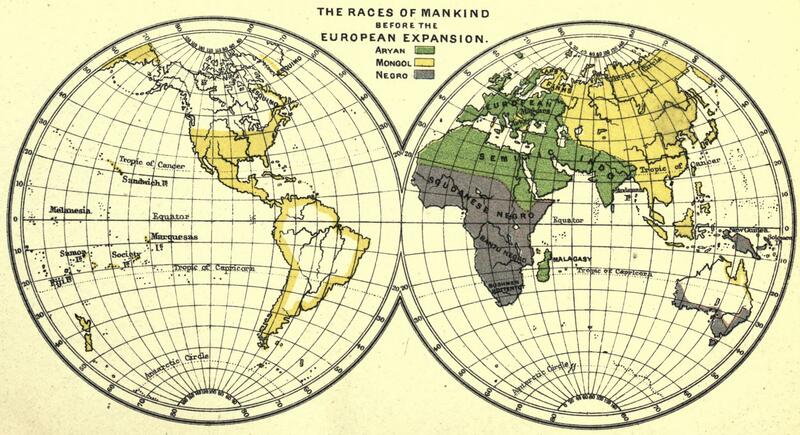 A 1891 map from the philosopher Alfred Caldecott, which shows only three races. The 1848 map (the first map, above) was drawn by the American librarian, botanist, and anthropologist, Charles Pickering. Pickering believed that each race had been separately created. He noted that anthropologists of his time often spoke of three, four, or five different races, but that there had thus far been no way of representing their geographical distribution. In an attempt to rectify this, he joined an expedition in 1843 to travel to Africa and South Asia to conduct a study of races. Relying on oral histories and his own observations, five years later, he published his book, The Races of Man, and Their Geographical Distribution, in which he declared he had seen all of the eleven races labeled in the map (page 2). The route and extent of Pickering’s travel is also inscribed upon the map. The 1891 map (the second map, above) is found in English Colonization and Empire, a 1891 book by the English philosopher Alfred Caldecott. In this work, Caldecott, whose interests included theology, psychology, and moral philosophy, tried to give an account of races in relation to the historical development of empires and colonialism – what he calls ‘the diffusion of European civilization over the face of the inhabited and habitable world’ (page 3). Caldecott recognized that others had delineated a greater number of races – including Pickering’s eleven – but decided to boil down the differences to a number that he felt was ‘suitable for ordinary use’ (page 217). Unlike Pickering, Caldecott noted that ‘in the very early childhood of the (human) race uniformity may have prevailed’ (page 1), and that racial differences developed over the course of history. While there is evidence for what look like racial attitudes (see Mallon, 2016) and differentiations resembling racial categories in earlier periods, the French physician François Bernier’s 1684 text A New Division of the Earth is generally regarded as having first outlined a modern conception of human races. A nineteenth-century translation of this text is cited below. Montagu published a series of works on the subject through the 1940s, including the book Man’s Most Dangerous Myth: The Fallacy of Race, and wrote the UN statement in 1950. It should be noted that Montagu did not deny the existence of biological ‘races’ (what might today be called ‘populations’) as such, but rather argued that a biological definition of race did not correspond to any of the generally used (‘folk’) notions of race at the time. It should be noted that anti-realists do not deny that there really are widely held ideas about race, and that the discourse these ideas generate has real social significance. They may argue, however, that these ideas do not genuinely represent races, but something else that has been confused for races – this is the mismatch problem (for example, see Glasgow ). They may also argue that some of the categories offered by race realists do not allow any way of identifying the race of a given individual; this also precludes these categories from being genuine races (for example, see Appiah ). For example, a prominent racial skeptic, Kwame Anthony Appiah, has over the years moved from the eliminativist position – holding that talk of races should be avoided altogether (see Appiah, 1985) – to holding that ‘the way forward in the racial domain isn’t – as I’m afraid I used to think – just to sort of as it were pretend that racial identities aren’t there. It’s to moderate them, it’s to recognize that you can have profound friendships across races and nations and cultures and religions, and it’s to stop the essentialization (of races)’ (from around 53:40 mins of his 2016 Reith Lecture on the topic [transcript]). The analogies used here are from Taylor (2000) in his response to Appiah (1985). As described in Mallon (2006) and James (2017). This approach to social kinds has been laid out and defended by Hacking (1995, 2006), and is described in relation to races in Mallon (2006). A view of this sort is defended in Root (2000) and also described in Mallon (2006). The cladistic conception of race was first outlined and defended in Andreasen (1998). Importantly, Andreasen regards this naturalist view of race as compatible with a constructivist approach. One challenge to this position has been that the account of race one gets from a naturalist conception differs so widely from a common-sense conception that it is wrong to call the naturalistic conception a conception of race at all (the ‘mismatch problem’, as noted earlier). For an interesting exchange on this semantic point, see Glasgow (2003) and Andreasen (2005). The seminal work in population genetics that triggered a new debate about this kind of position is Rosenberg et al (2002). It is worth noting that the authors of this paper did not set out to prove a naturalist argument about race, and have generally denied, or declined to assert, that their findings support racial naturalism – the naturalist implications have instead been drawn by other scholars interpreting these findings. For a representative paper, see Spencer (2014). For a survey of recent naturalist arguments and some of their challenges, see Spencer (2018). For a skeptical critique, see Appiah (2006); for a constructivist critique, see Hochman (2013); and for a naturalist response to these critiques, see Spencer (2015). For general naturalist responses to criticism, in addition to Spencer’s 2015 paper, see also his closing keynote at the ‘Genomics and Philosophy of Race’ conference, UC Santa Cruz (2014), as well as Spencer (2018). Often, philosophers who argue in favor of the biological reality of race on these grounds will still reject some of the criteria of traditional racial naturalism. Importantly, they may reject the criterion that races need to be discrete groups (again, see Quayshawn Spencer’s closing keynote at UC Santa Cruz ), or that races explain the kinds of psychological and behavioural traits as asserted by traditional naturalism. Mallon (2006) lays out eight relevant facts about the world that leading proponents of racial skepticism, constructivism, and population naturalism all seem to agree about. Of course, as in any scientific discussion, new research and technology often brings up new findings about the state of the world, and some papers or specific positions become outdated. The point is that with a few exceptions, philosophers typically accept the data that biologists and social scientists provide – though they may of course disagree about the interpretation of that data. So, like some skeptics, we may be eliminativists about race, believing that there is nothing socially or politically useful about racial concepts (or that they are harmful), and hold that we ought not to have them. Or, like some naturalists, we might think that racial concepts have medical value, and hold that race should be defined in bio-medical terms; and so on. The project of making normative judgements about the existence of race (and gender) was first outlined in an important paper by Haslanger (2000), where to Appiah’s (1985) skeptical proclamation that ‘there is nothing in the world that can do all we ask “race” to do for us’, she offers the rejoinder: ‘we might instead ask “race” to do different things than have been asked before’. The above observations about the current state of the discourse, and the argument that the nature of the dispute itself is normative, were later made by Mallon (2006). In addition to Spencer (2014), see this write-up of a talk he presented at Carnegie Mellon (2017). A version of racial pluralism is also defended by McPherson (2015). For research on the possible links between racism and beliefs about racial ontology, see Shulman and Glasgow (2010). For discussions about the relevance of race to medical research, see Burchard et al (2003) and Cooper, Kaufman, and Ward (2003). ‘The Race Question’. UNESCO and its Programme, Publication 791 (1950): 1-11. UNESCO. Andreasen, Robin O. ‘A New Perspective on the Race Debate’. The British Journal for the Philosophy of Science (49), no. 2 (June 1998): 199-225. Andreasen, Robin O. ‘The Meaning of “Race”: Folk Conceptions and the New Biology of Race’. The Journal of Philosophy 102, no. 2 (February 2005): 94-106. Appiah, Kwame Anthony. ‘The Uncompleted Argument: Du Bois and the Illusion of Race’. Critical Inquiry 12, no. 1 (Autumn 1985): 21-37. Appiah, Kwame Anthony. ‘How to Decide If Races Exist’. Proceedings of the Aristotelian Society 106 (2006): 365-382. Appiah, Kwame Anthony. ‘Mistaken Identities: Colour’. The Reith Lectures (BBC: November 2016). Podcast. [transcript]. Bernier, François. ‘A new division of the earth, according to the different species or races of men who inhabit it, sent by a famous traveler to Mons, nearly in these terms’. Translated by T. Bendyphe in Memoirs Read Before the Anthropological Society of London: 1863-64, Vol. 1. Trübner & Co., London (1865): 360-364. Burchard, Esteban González, et al. ‘The Importance of Race and Ethnic Background in Biomedical Research and Clinical Practice’. The New England Journal of Medicine 348, no. 12 (March 2003): 1170-1175. Caldecott, Alfred. English Colonization and Empire. New York (1891). Cooper, Richard S., Kaufman, Jay S., and Ryk Ward. ‘Race and Genomics’. The New England Journal of Medicine 348, no. 12 (March 2003): 1166-1170. Glasgow, Joshua. ‘On the New Biology of Race’. The Journal of Philosophy 100, no. 9 (September 2003): 456-474. Glasgow, Joshua. ‘Another Look at the Reality of Race, By Which I Mean Racef’. New Waves in Metaphysics, edited by Allan Hazlett. Palgrave Macmillan (2010): 54-71. Hacking, Ian. ‘The looping effects of human kinds’. Causal Cognition: A Multidisciplinary Approach, edited by Dan Sperber, David Premack, and Ann James Premack. Oxford University Press (1996). Hacking, Ian. ‘Kinds of People: Moving Targets’. Proceedings of the British Academy, Vol 151, 2006 Lectures. British Academy (2007). Hochman, Adam. ‘Against the New Racial Realism’. The Journal of Philosophy 110, no. 6 (June 2013): 331-351. Haslanger, Sally. ‘Gender and Race: (What) Are They? (What) Do We Want Them To Be?’ Noûs 34, no. 1 (March 2000): 31-55. James, Michael. ‘Race’. The Stanford Encyclopedia of Philosophy (Spring 2017 Edition). Edward N. Zalta (ed.). Lewontin, Richard. ‘The Apportionment of Human Diversity’. Evolutionary Biology 6, edited by T. Dobzhansky et al. (1972): 381-398. Machery, Edouard. ‘Are Races Biologically Real?’ (Rutgers University, 2013). Video. Mallon, Ron. ‘“Race”: Normative, Not Metaphysical or Semantic’. Ethics 116, no. 3 (April 2006): 525-551. Mallon, Ron. ‘Constructing and Constraining Representations: Was Race Thinking Invented in the Modern West?’ The Construction of Human Kinds. Oxford University Press (2016). McPherson, Lionel K. ‘Deflating “Race”’. Journal of the American Philosophical Association 1, no. 4 (Winter 2015): 674-693. Montagu, M. F. Ashley. Man’s Most Dangerous Myth: The Fallacy of Race. Columbia University Press, New York (1942). Pickering, Charles. The Races of Man, and their Geographical Distribution. London (1851). Root, Michael. ‘How We Divide the World’. Philosophy of Science 67, no. 3 (September 2000): 628-639. Rosenberg, Noah A., et al. ‘Genetic Structure of Human Populations’. Science 298, no. 5602 (December 2002): 2381-2385. Shulman, Julie L., and Joshua Glasgow. ‘Is Race-Thinking Biological or Social, and Does It Matter for Racism? An Exploratory Study’. The Journal of Social Philosophy 41, no. 3 (September 2010): 244-259. Spencer, Quayshawn. ‘Philosophy of Race Meets Population Genetics’. Genomics and Philosophy of Race (UC Santa Cruz, April 2014). Video. Spencer, Quayshawn. ‘A Radical Solution to the Race Problem’. Philosophy of Science 81, no. 5 (December 2014): 1025-1038. Spencer, Quayshawn. ‘Philosophy of race meets population genetics’. Studies in History and Philosophy of Biological and Biomedical Sciences 52 (August 2015): 46-55. Spencer, Quayshawn. ‘Race realism I: Are biological races real?’ Philosophy Compass 13, no. 1 (January 2018). Taylor, Paul C. ‘Appiah’s Uncompleted Argument: W.E.B. Du Bois and the Reality of Race’. Social Theory and Practice 26, no. 1 (Spring 2000): 103-128. Abiral has a BA in the Humanities from New York University Shanghai. He is interested in philosophy, history, literature, and their intersections. He lives in Lalitpur, Nepal, and can be found tweeting at @abiralcp.